Escalera Staircat Powered Stair Climber (60" H & 1200 LB Capacity) - Escalera MS-1-60 is one of the finest, strongest, most reliable battery powered stair climbers on the market today which constructed of a tough tempered aluminum alloy, making the handtrucks stronger than magnesium, but lighter than steel. Every Escalera Stair Climber ships with the sealed gel-cell battery, automatic battery charger, and one automatic rewind safety strap included. The Escalera Stair Climber hand trucks are 24 inches wide and range in size from 60 inches to 72 inches tall. The ESCALERA STAIRCAT is proudly made in the United States of America. Used around the world by many different types of businesses, warehouses and private companies, the ESCLAERA STAIRCAT is an exceptional piece of modern day equipment. Whether there is product that needs to be moved across a flat surface or up several flights of stairs, this hand truck can do the job. Ergonomic, plated handles, angled for easier load handling. Magnum Handle upgrades available. Sculptured, long-lasting, non-marking vinyl padding. Ergonomic placement of multiple hand holds give you a place to hold where you need it. Fastest, easiest to use, automatic rewinding safety strap available. Upper and lower straps optional. Frame made of tough tempered aluminum alloy. Stronger than magnesium - lighter than steel! Non marking wheels and lifting feet protect all step and floor surfaces. 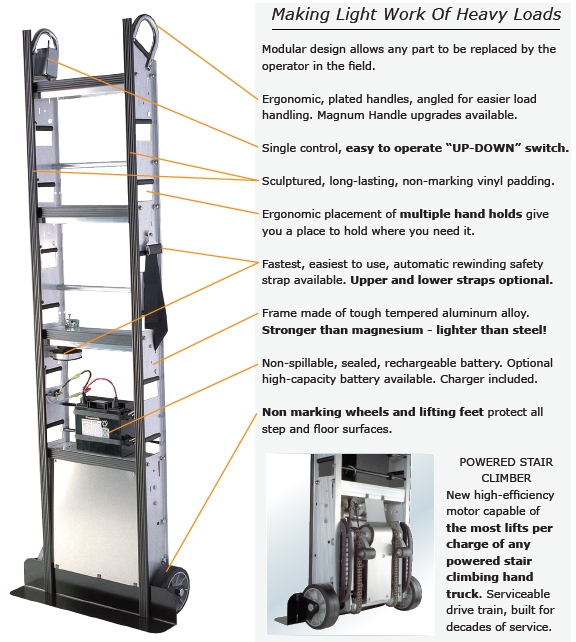 POWERED STAIR CLIMBER New high-efficiency motor capable of the most lifts per charge of any powered stair climbing hand truck. Moving these large items can easily be done with one (1) worker, trained on using the stair climber safely. The ESCALERA STAIR CLIMBER works like a robot, making a second, third or fourth employee not necessary. The following Videos show on how these amazing stair climbers tackle any number of jobs are also easily available. The videos show in great detail how the ESCALERA works, moving up stairs and down stairs. Escalera Inc. warrants the stairclimbing handtrucks manufactured by them-when lubricated and operated as recommended-to be free from defect in material and workmanship, for a period of one year after delivery. All warranty items are to be returned to Escalera freight prepaid for inspection. If the item is determined to be defective, Escalera will repair or replace the item. Alterations and/or careless or improper usage void this warranty. A nominal charge will be made for repair of units which are not operable for reasons other than defects in workmanship or material. Customer is responsible for shipping costs to and from repair facility. 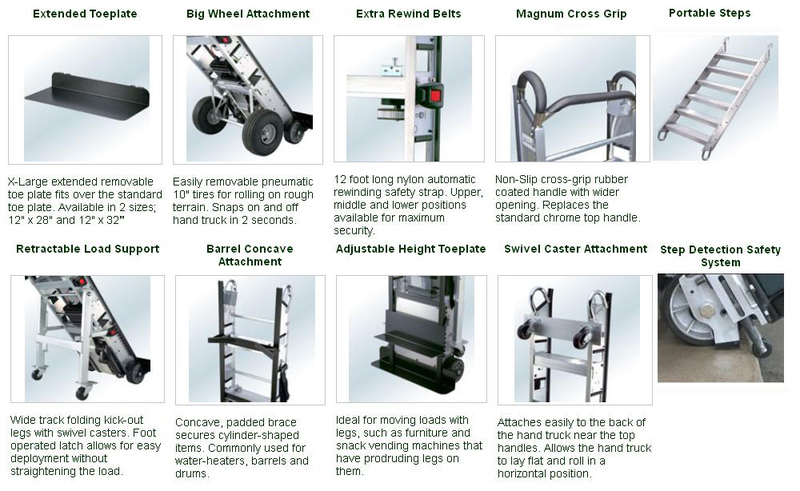 Shop all the different available stair climbing hand trucks on the market. Free Delivery in the Continental USA, exclusions apply, see Terms for more details. Pay with Visa, Mastercard, American Express, Discover, Paypal, or Amazon Pay. Your information is protected through SSL 128 Bit Encryption by DigiCert Inc.
Email us 24/7 for quick responses, or call us on our toll free number. Call us at (888) 811-5941 or (732) 276 - 7164. © Electric Stair Climbing Hand Trucks.